Hair treatment with the use of babassu oil from Guhl, is more like a mask of a lightweight, gel formula, rather than a cosmetic resembling a typical hair and body butter. It comes in a nice plastic container decorated with floral patterns and a silver lid. The capacity of the product is 150 ml. Guhl mask contains volatile alcohols (the so-called good alcohols), that improve penetration of active substances into the skin. Another significant ingredient is babassu oil. It is a unique oil (to be more precise – a butter) that contains up to 70 % lipids. Those take part in the processes of formation of cell membranes. Babassu oil is made of mainly essential fatty acids, which have small particles that easily penetrate low porosity hair. What is more, it protects hair from damages, contains natural UV filter that protects from harmful sun radiation. Oil will not allow toxins penetrate inside hair and slows down ageing processes. Accordingly to the producer, the mask will quickly smooth the coarse surface of hair, provide shine and restore vigour and vitality to even the most tired wisps. Additionally, the producer ensures that the mask helps to maintain proper pH of the scalp and cares for the proper level of hydration. However, on the list of components, you can find a range of chemical substances and artificial dyes as well as fragrance (this can be the bad, over-drying monohydric alcohol). In this case, it would be a better idea to reach for a pure babassu oil. This mask is supposed to be suitable for all hair types, however, babassu oil will only be beneficial for low porosity hair. On the contrary to what the manufacturer says – try to select hair care products with caution and carefully read their labels. Guhl products are concentrated which is why it is enough to use only small amounts. For a single treatment, a teaspoon of the product should be more than enough. The cosmetic ought to be applied after washing to damp wisps – leave it in from 5 to 10 minutes, then rinse. 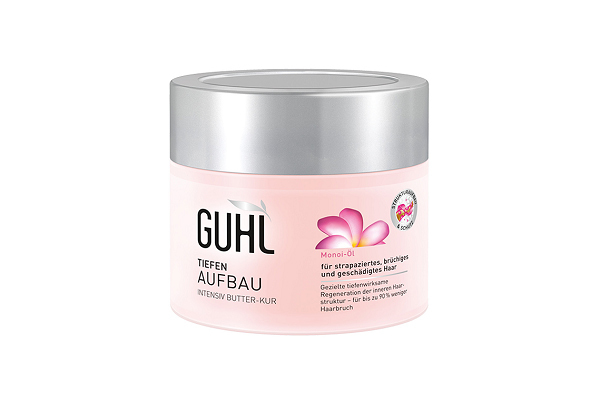 Guhl hair mask is inexpensive, smells nice and is very efficient. Unfortunately, the list of its advantages ends here. Even the great babassu oil will not help for the presence of chemical substances and artificial colourants that should have stay ways from any kinds of hair products and scalp. It would be better to use it only on the strands, omitting scalp.